This is our rig. We have a Landrover Defender – the 1995-99 models with the 300TDI engines are best – after that vehicles all became electric and impossible to fix when things go wrong, especially in the bush. In 2010 the camper cost us under $20,000 delivered. The vehicle cost us $10,000 around 2005. This vehicle suits the pop-top camper we have which has living space of 8′ by 6′ with a Queen sized bed over the cabin. It folds down to being about the height which any 4WD would be with roof racks and a spare on top, meaning someone has usually already cleared overhanging timber. 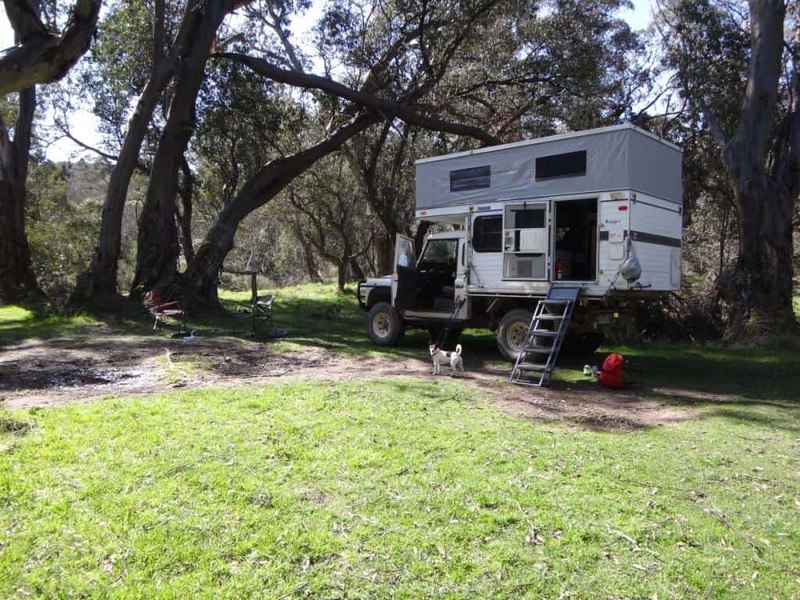 It is quite big enough for us, has stove, fridge, dinette for four, space heater, water heater, outside shower. Also, once you try to push out dimensions (you could probably go out to 6’6″ wide) you start to not be able to fit down 4WD tracks. Similarly length increases mean you can’t get over steep sections etc. Our Landie has heaps of clearance and twin diff locks and winch so it will go most anywhere – and has! (I intend to install http://www.secondair.com.au/why.htm to extend its range even further). I may also add a side awning for socialising and a small rear one for the shower/toilet, etc. I have purchased four under tray boxes which will contain wheel chains, Alpacka rafts https://alpackarafts.com/ etc. These <2 kg rafts (suitable for Grade 3+ rapids) are a great way to access remote country. I have the Fiord Explorer which they also describe as a ‘moose boat’ for obvious reasons! If you have a take-down rifle (as I do) it fits inside my pack liner bag; otherwise Aloksak http://www.loksak.com/products/aloksak make a waterproof rifle bag. I also intend to build a motorcycle carrier for the rear for my Postie bike http://www.theultralighthiker.com/honda-ct110/ so I can get back to where I started on canoeing/hiking trips http://www.theultralighthiker.com/motorbike-hitch-carrier/ . We often take it into remote mountain country where it make a great base for walks, fishing, hunting, canoeing etc. I will also change the water heater (for this one: http://www.theultralighthiker.com/girard-tankless-water-heater/) to reduce some weight and gain some space at a future time. I will be installing solar panels on the roof. Of course we have a dual battery set-up.The electrics is entirely 12 volt so we are independent, but we could use a bigger inverter for Della’s hair drier. We have two 4 kg gas bottles for the fridge, stove and heaters. We could also use another 85 litre water tank under the tray. (There is already one there and one in the camper). That would take our water supply to over 250 litres, enough for around 10 days.